Modern times call for modern fairytales. 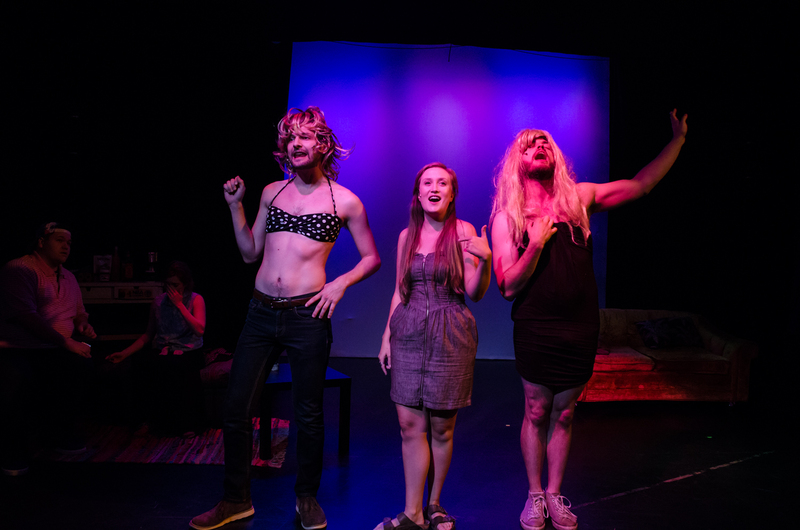 So when we heard there was a new musical called Tinderella, by FaultLine Theater, happening at PianoFight we knew we wanted to check it out. Brittany: I enjoyed it. I thought it was delightful. They were really good voices and it was clever. Katie: I was pleasantly surprised at the talent. All of the 5 actors had good voices and the two girls – WOW such great voices. Also, I’ve done some online dating, so I felt close to the content too. B: Yeah, but I don’t think my mom would get it . There were too many pop-references. You kinda need to be living in San Francisco, or another big city, and be in your 20s or 30s to really get this show. K: Definitely. I also thought they could tie in the story of Cinderella little better, since it is called “Tinderella”. B: Yes the only thing she really has in common with Cinderella is she forgets her shoes at a party. But it’s pretty unrelated otherwise. He doesn’t look for her when she runs. She doesn’t have weird family drama. There’s not any magic (although one bizarre moment where she appears to talk to birds). It wasn’t a fairytale, more of a story about how fairytales don’t really happen. Also the ending fizzled a bit for me. It felt like they ran out of ideas and just found the fastest way to wrap it up. K: The night itself definitely didn’t fizzle for me. I really enjoyed the whole night out. A good show, good food, good drinks. Just one Lyft and everything you need for a great night all in one venue. B: I’m already looking forward to our next DT&D date at PianoFight! The Verdict: If you are in your 20’s or early 30’s and have done some online dating, this show will be a hoot for you. The Drama Talk: Overall, good cast and funny concept, but the script still needs a little work. It just seemed like they ran out of material, and never really lived up to the un-said promise of giving us a contemporary retelling of Cinderella. We left wanting more, specifically more live dramatizations of Tinder date train-wrecks. The Drinks: You are in luck. Going to a how at PianoFight means you have access to a full kitchen and bar. AND you can bring your drinks in the theater and sip while you watch. Tinderella runs through February 27th at PianoFight. Tickets are available on Faultlines Theater’s website for $20-$30. Right now there are VIP front row tickets available on Goldstar for $20.